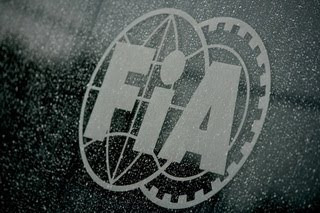 The Formula One Teams’ Association expects to reduce carbon emissions in the sport by 12.4% by 2012. A FOTA-commissioned report into the environmental impact of Formula found that each team produces an average of 215,558 tonnes of CO2 per year. Of that, 0.29% comes from the burning of fuel by F1 cars in testing and races. Over half an F1 teams’ emissions are produced in producing parts and electricity consumption accounts for another 30%. The FIA and FOTA are already working together to tailor the 2013 technical regulations to ensuring that all engines and powertrains used in Formula One by that date will showcase, and provide a platform for the ongoing development of, technologies designed to enhance fuel efficiency. As all the teams brought new parts to this race and the track that is very hard to overtake .Qualifying was very important and we saw yesterday how tight the field is . One of the big tames that was in need for a good result Ferrari and this weekend was very important for them as they put a big upgrade on their car and it proved to made the team faster,The Qualifying did not went the way Ferrari wants but they still managed fourth and fifth. In the race the start was very critical as the track is very hard to overtake Lewis Hamilton made a great start from third on the grid as he passed Webber and was side by side with Vettel at the first corner. 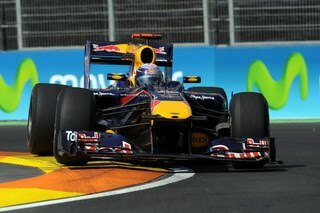 With Mark Webber back to ninth after the first lap his race ruined and he was trying his best to bring home points. The race was decided on lap ten where the safety car came out as the cars that passed the pit lane where Hamilton Alonso And Massa Hamilton passed the safety car illegaly and he pit and came out behind leader Sebastian Vettel ,Both Ferraris have to stay behind the safety car and when they pitted they came out 10th and 15th and they finished 8th and 11th (after the stewards panelties) While Hamilton who passed the safety car and was given a drive through penalty finished in second position that’s racing!! Micheal Shumacher pitted from third but when he was going out the red light was on and he had to wait but for what I don't know ?? One man who had a different strategy was Kamui Kobayashi who stayed out and was on the harder tyre he did more than 50 laps on the hard tyres and pitted seven laps before the end from third position and came out just behind Alonso who was trying to pass Buemi but then got passed by Kamui Kobayashi and at the Final corner Buemi made a mistake and ran wide to let Kobayashi through. This race should make the FIA look at the rules In a different way as if the Stewards gave Hamilton the Penalty right after the safety car he wouldn't finish second. 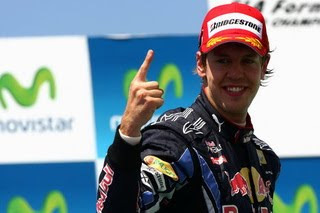 Sebastian Vettel wins the in Valancia as teammate Mark Webber had a big accident, Vettel finished ahead of Mclarens Lewis Hamilton and Jenson Buttonbut the result remain not sure as the FIA is investigation the cars from 3-8 but Kobayashi . The race started with Sebastian Vettel on pole and he remain in that position but teammate Webber had a bad start and fell from 2nd to 9th by the end of the first lap. The race began very booring until Webber hits Kovalainen and the safety car is deployed ,the biggest loser of the safety car were both Ferraris with Alonso back to 10th and Massa back to 15th . Lewis Hamilton was investigated by the stewerds and got a drive through panelty ,but he came in and out in the same position. The race continued in the rout with Vettel leading Hamilton and Kobayashi not pitting hr pitted on lap 55 and came behind Alonso but when Alonso was trying to pass Buemi Kobayashi was able to pass him and pass Buemi at the final corner. With almost all the teams bringing new parts to this as race as it’s stands for the season half way,with Ferrari, Renault ,Williams and Mercedes trying Red Bull’s ‘’blown diffuser’’exhaust it seems it worked well for Ferrari And Renault but what happened with Mercedes remains to be the biggest question. It’s still a question if Mercedes will keep developing this years car or switch their resources to next year and give Micheal Shumacher and Nico Rosberg a good car to fight for the championship. One of teams that made a great step forward is Williams as they got both cars into Q3 and that will help them with their fight with Force India in the championship as it seems they jumped both Mercedes and Force India .Rubens Barrichello won in Valancia last year and is optimistic for the race tomorrow. Mclaren looking strong for the championship as they thought they would struggle here because they were late to adapt Red Bull’s ‘’blown diffuser’’exhaust but they will put it on the MP4_25 in Silverstone in two weeks time as it should be worth half a second . Can Hamilton stop Red Bull from taking one-two finish tomorrow ,will Alonso make it to the podium ,if Red Bull finished one-two they will sail a way in the championship as the track should not suit their car,where in Silverstone with high speed corners . Who will win in Valancia tomorrow ,have your say in the Comments? Red Bull's Sebastian Vettel And Mark Webber lock out the front row for the Valancia Grand Prix followed by Mclaren Mercedes's Lewis Hamilton . Qualifying was very tight between the teams in Q2 with less than a second covering the top 16 cars. Every thing went as usual in Q1 with the buttom teams fighting for the last seven positions with HRT's drivers in 23th and 24th with Chandhok and Senna the Virgin cars took 22th and 21th with Di Grassi and Glock the Lutos Cars were the quickest again with Jarno Trulli And Heikki Kovalainen and as usual Kamui Kobayashi took the 18th spot. In Q2 thing got very tight and the gsp from first to tenth is just over half a second with Sebastian Vettel leading teammate Mark Webber and Robert kubica And Massa with just a tenth the biggest surprise was the Williams drivers who both made into Q3 ahead of both Mercedes And Force India with Nico Rosberg 12th and Micheal Shumacher 15th. All Red Bulls,Renaults,Ferraris,Mclarens and Williams made it into Q3 ,Lewis Hamilton was the first driver to get bellow 1:38 and got an early pole Webber did a good lap and was a tenth faster than Hamilton then Sebastian Vettel made a perfect lap to get pole with 1:37.587 Webber did another lap and was less than a tenth of Vettel's lap,the improved Ferraris could only manage fourth and fifth With Alonso And Massa,Kubica lined up sixth ahead of Mclaren's Jenson Button with Nico Hulkenberg ahead of last year Winner Rubens Barrichello with Vitaly Petrov in thenth. Ferrari looked strong on both friday sessions and the team think hte car is good on hugh fuel and low fuel loads with their good one lap performance they have a good pace to challenge for the top spots on qualifying. Mclaren are not far from Fernando Alonso's pace with Lewis Hamilton very close even though he lost time behind Micheal Shumacher later in hte session. Lewis Hamilton feels Ferrari have an advantage with their version of Red Bull’s ‘blown diffuser’ as they put it on the F10 before Mclaren. It was always going to be interesting to see how quickly the blown-diffuser cars could get up to speed – and they looked very competitive this afternoon, particularly over a single lap. And the grip they appear to have through the high-speed stuff could make them difficult for us to touch. Red Bull were very quick as expected in the final sector were there is high speed corners and with their F-DUCT it's remain to be seen if they will use it tomorrow or not but it seems they got it working good for them. Mercedes were again fast with Nico Rosberg but as always that does not give as a clear vesion of their true pace,Shumacher spent both sessions learning the track as it's his first visit to the track and he reported he hasn't find it's rhythm yet. "It was exciting to drive the track for the first time today, probably even to a bigger extent than I had anticipated yesterday after checking it. So this morning for me was mostly about getting a feeling for the track. You need to get used to it but I found it quite comfortable to drive even if some of the corners are blind. However it's demanding to get the real rhythm which I have not totally found over one lap yet. The long runs went okay and all in all it was not too bad today, depending on the fuel loads obviously which we need to look into more deeply now. Regarding Lewis, I must apologise as I did not see him and was not informed that he was there. As I was planning my lap at that moment and looking ahead, I was unfortunately in his way." We re going to see a great battle tomorrow in Q3 and the other thing is we are going to see a lot of surprises with big names failing to make it to Q3 as the battle in the midfield is very close. 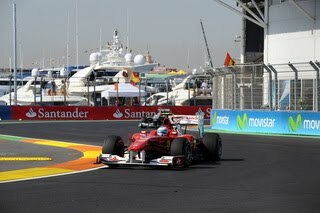 Ferrari's Fernando Alonso set the fastest time in Valancia's afternoon session ,Alonso was the fastest driver for almost all the session ,Teammate Felipe Massa has a spin at turn 4&5 and his car stoped on the circut but he was able to complete his programe. 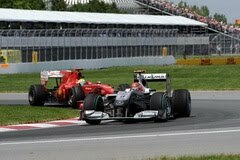 With their bad performance in Turkey Ferrari bounced back in Montreal but the track suited their F10 ,And in Valancia the F10 should be fast and with Red Bull's RB6 style exhaust they should be very quick and the question is will Ferrari have the edge around the street circuit of Valancia. 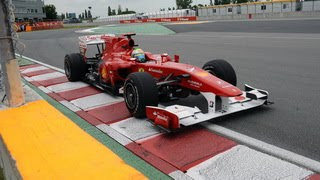 Ferrari tested their upgraded car as some media call it 'F10b' in Vairano with test driver Mark Gene ,And Fernando Alonso drove the car in Fiorano for ‘filming purposes’. Mclaren will introduce few parts here but the big upgrade with Red Bull's RB6 style exhaust will be debuted in Silverstone. Red Bull will bring their version of Mclaren's F-DUCT system back after failing to put the system in Montreal as they said it affects the overall downforce,Red Bull could fall behind Mclaren and Ferrari this weekend so they should make the F-Duct working good for them as Christian Horner claim their Renault V8 is 25-30 horse power short than Mercedes. Renault has been making a great development on their car and their now ahead of Mercedes and they should be strong in Valancia with Robert Kubica and Vitaly Petrov. 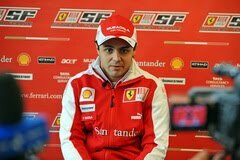 Felipe Massa should make a good race in Valancia if he wants to keep his championship hopes alive and reduce the gap to teammate Fernando Alonso and Championship leader Lewis Hamilton. 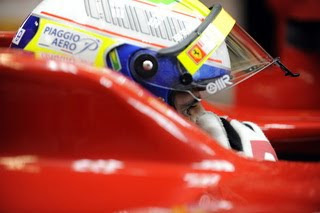 Micheal Shumacher will be driving in Valancia's street circuit for the first time he will have a busy Friday . Can Lotus close the gap to BMW-sauber and maybe make it to Q2 for the first time this season with Jarno Trulli and Heikki Kovalainen. Have your say in the comments . The FIA’s World Motor Sport Council has agreed a number of significant changes to the Formula One regulations.aerodynamic revisions designed to boost overtaking, a ban on F-ducts, and the return of a 107% qualifying rule. Under new moveable bodywork regulations for next season, drivers will be able to adjust the rear wing from the cockpit as soon as they are two laps into the race. However, the system’s availability will be electronically controlled and it will only be activated when a driver is less than one second behind another at pre-determined points on the track. The system will then be deactivated once the driver brakes. It will be available at all times throughout practice and qualifying. In a move that could frighten one or two of the new teams, next year any driver not setting a qualifying time within 107% of the fastest Q1 lap will not be permitted to race. Stewards, however, will have the power to grant exceptions in extenuating circumstances, such as where a driver has recorded a suitable time in a previous practice session. Several other measures have been brought in with immediate effect. Following the late-race confusion at Monaco, where Michael Schumacher passed Fernando Alonso, the safety-car rules have been clarified. No overtaking is allowed if the safety car is on track on the final lap. And following the spectacle of Lewis Hamilton pushing his fuel-light McLaren back to the pits at the end of Montreal qualifying, new rules state that cars required to give a post-session fuel sample must arrive back in pit lane under their own power. 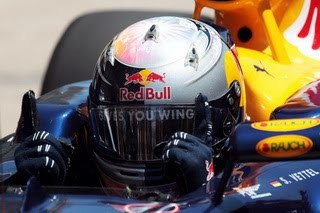 From 2011, adjustable bodywork may be activated by the driver at any time prior to the start of the race and, for the sole purpose of improving overtaking opportunities during the race, after the driver has completed two laps. The driver may only activate the adjustable bodywork in the race when he has been notified via the control electronics that it is enabled. It will only be enabled if the driver is less than one second behind another at any of the pre-determined positions around each circuit. The system will be disabled the first time the driver uses the brakes after the system has been activated. The FIA may, after consulting all the competitors, adjust the time proximity in order to ensure the purpose of the adjustable bodywork is met. Based on his career résumé and comparative F1 testing times, the World Council has approved the granting of a four-race probationary super license to Chinese driver Ho-Pin Tung. 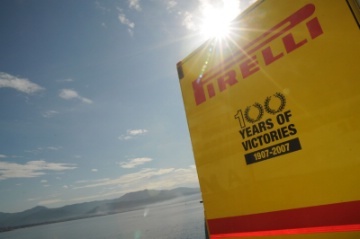 Pirelli have beaten off competition from Michelin to become the official F1 tyre supplier from 2011. The Italian tyre manufacturer last supplied F1 teams in 1991. Tyrrell, Brabham, Dallara and Benetton used its products while the rest of the field were supplied by Goodyear. Nelson Piquet scored the last win for a car on Pirelli tyres in the 1991 Canadian Grand Prix. He inherited the win when Nigel Mansell’s Williams broke down on the last lap. Prior to that, Pirelli had gone five years without a win. But the company was a dominant force in the first years of Formula 1, with several drivers winning world championships on their tyres in the 1950s. Valancia has been in the calender for two years and it didn't host an entertaining racing ,The Drivers think it's too simple and wide with so much straights and it gets a lot of grip in the Qualifying and the race so the drivers have different opinions about the track. I think it’s good for the championship to have a variety of circuits – we’ve just come from a fast, flowing road course in Canada, to a tight street track in Valencia. And, next month, we’ll be at Silverstone – one of the fastest tracks of the year, and a circuit with incredible history. As a driver, that sort of variety makes the racing exciting and unpredictable, which is all you can really ask for. [Valencia] is not a circuit where we’ve seen too much passing in the past, but I think this year could be different – the grid is so tight, there were battles all through the field in Montreal last week, so I think we could have a close and exciting race this year. The street circuit there is not so different in terms of its characteristics to the Montreal track and on top of that, we expect to have some more updates for the F10 to make it even more competitive with those ahead of us in the championship. Valencia has not produced very exciting races so far, but I enjoy the track, as the only time I have raced there, in 2008 – it was one of the races I missed last year after my accident – I won. 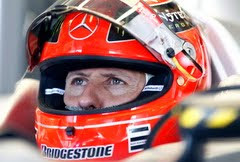 Ferrari on Tuesday confirmed reports that Pat Fry is joining the famous Italian team. It emerged at the weekend that the 46-year-old Briton, who until recently was heading McLaren's 2011 car project as long-time joint chief engineer, was linked with a move to the Maranello based squad. Italian reports had said Fry, although currently on compulsory 'gardening leave', will be able to have an impact on Ferrari's next car. A team statement on Tuesday confirmed that Fry will begin his new role as assistant technical director, reporting to Aldo Costa, on 1 July. Ferrari said the "structure of the technical department remains (otherwise) unchanged". Fry joined McLaren from Benetton in 1993. "I think it was probably good for him, the right decision for him to take a bit of a break, take a breather," McLaren boss Martin Whitmarsh said last month. 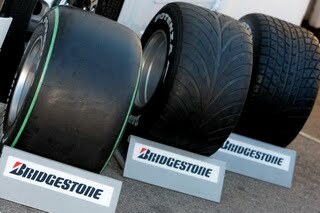 Bridgestone has altered the choice of tyre compounds on offer for five forthcoming races on the F1 calendar. The move is an attempt to re-create the conditions which produced an unpredictable and exciting race in Canada last week. In the German Grand Prix drivers will have to use both the super-soft and hard tyres during the race for the first time ever. It will also be the first time F1 has raced on the current configuration of the Hockenheim circuit using slick tyres. Bridgestone has also changed its tyre allocation for the Hungarian, Belgian, Italian and Singapore Grands Prix compared to what were used last year. At the Hungaroring the super-soft and medium tyres will be used instead of super-soft and soft compounds. At Spa-Francorchamps and Monza Bridgestone will supply soft and hard tyres where last year soft and medium compounds were used. And at Singapore the choice of tyres will be super-soft and medium – last year the teams had super-soft and soft tyres. The major interest of this allocation announcement is that we are bringing the hard and super soft compounds to Germany. The characteristics of the Hockenheim circuit allow us to bring the compounds from the extremes of our softness range. This will give us very good data for evaluation and will be interesting for those who have called for a bigger difference between the allocated tyres. or from the team but the british driver have got every thing to his liking in the last two races..
Lewis Hamilton: It's great to be leading the world championship, but, I have to be honest, Formula One is so tough and so competitive at the moment that you can't take anything for granted - and, while I might be on top right now, I know that I'll need to fight for every lap of the next 11 races to remain up there. And, I think I'm like the fifth leader of the championship so far this year, so it's pretty clear that it's not so easy staying on top. Our sport is so incredibly competitive at the moment - and we're seeing different teams come to the forefront all the time - that this championship is going to be as much about playing the long game - minimising mistakes, scoring points at every race - as it is about success at individual races. And, actually, I think that's the first time you can probably say that about a Formula One championship. Whether it's the changes to the points system, or just the fact that there are maybe as many as 10 drivers out there with the machinery capable of winning races, you can't afford to just take the points. You've got to be on the limit all the time - and I love that, because that's how I love to race. Q: So how on the limit was your race in Montreal? LH: It was pretty full-on, but it wasn't flat-out in the sense of pushing from the start to the finish; it was full-on because you had to stay absolutely focused on every lap, making sure the tyres were looking after themselves while also trying to attack, or hold off somebody behind you. It's a complicated balancing act. The pit wall and the strategy team judged everything perfectly. Andy (Latham, race engineer) fed me lots of information throughout the race, and really acted like a second pair of eyes for me. The team and I worked well together for this result. 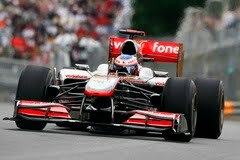 Q: People always expected the MP4-25 to go well at Montreal. Was the circuit a good match for the car's characteristics? LH: It was a good match, yes, but it wasn't a perfect one - we'd probably still look at other tracks coming up on the calendar as giving us a better opportunity to win. Montreal is quite an extreme circuit, and I think our strength was having a package that worked well against all those extremes. For example, we've been working very closely with Akebono all year to ensure that our brakes would perform consistently here, which is one of the toughest tracks of the whole year for braking. We felt that if we were able to push aggressively for the whole race, then it might give us an advantage by pushing other teams whose braking performance might be more marginal, particularly at the end of the race. And we've added up all those small gains everywhere. That's why we've got a car and a team that's working so well together at the moment. Micheal Shumacher come back is it that worse ?? Many peaple have said very bad words about Micheal Shumacher's come back to Formula1 and so many peaple think that he made a mistake coming back and that he would repulsive to his big history. Maybe we should wait and see what Micheal can do after the first half of the season and we must consider that the MPG_001 is not up to the pace of the leaders,and we must also be aware of that Micheal Shumacher is almost matching the pace of his teammate Nico Rosberg. Always when a driver comes to a new team it takes up to half a season for the driver to be comfortable with the new team and with in season testing ban it takes more than that. I'm expecting Micheal Shumacher to be back and up to speed within a race or two and by the end of the season he will be higher in the rankings than his teammate Rosberg,but the championship this season is out of reach,that will be determined in the next two races by the Mercedes team. But the big question that keep confusing me is that Red Bul and Mercedes(Brawn )last year they were very close last year, why the Mercedes is far from Red Bull's pace at the start of the season and now? where do you think Micheal Shumacher will finish this season in the championship ? A feature of Ferrari's heavily upgraded F10 car in Valencia next weekend will reportedly be Red Bull-style exhausts. Rival teams initially thought an illegal ride-height control system was the secret of the RB6's speed, but it is now believed that the layout of the rear of the car - including lowly-mounted exhausts - is the basis of the design. Spain's AS newspaper reports that the updated F10 will be between three and four tenths per lap quicker than the basic specification raced in Turkey and Canada. The report also said the change represents a fundamentally new aerodynamic direction for the car, opening up a new avenue for subsequent development. "The most important improvement in Valencia is not what we achieve there, but the way it opens us developments to be stronger for the remainder of the season," Fernando Alonso is quoted as confirming. As well as the lower exhausts, the 'B' car will feature modified rear suspension, AS continues to explain, in order to open a bigger channel of air "to double the downforce generated by the diffuser". "For Valencia, the focus has been on other areas of the car apart from the (F-duct) rear wing," team boss Stefano Domenicali is quoted by Brazil's Globo. Meanwhile, McLaren team boss Martin Whitmarsh has revealed that the championship-leading MP4-25 will feature a "reasonably big upgrade" at the British Grand Prix next month. Ferrari will run a KERS-equipped car in every race of next year's world championship, team boss Stefano Domenicali has revealed. 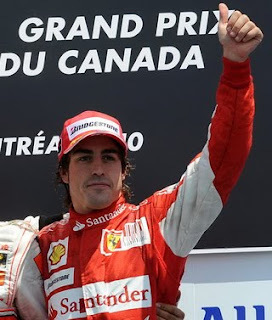 The confirmation was made after the F1 teams met in Canada to discuss technical matters relating to the 2011 season. Adjustable rear wings are also set to debut in order to boost overtaking, and FOTA's ban on using energy-recovering KERS systems is to lapse. Some teams including Ferrari had pushed hard to make the KERS systems much more powerful in 2011, but agreement has instead been made to lift the minimum weight of the car-plus-driver. As the weight handicap was considered among the problems of the KERS debut in 2009, the minimum limit will rise from 620 to 640kg next year. "The teams have agreed on that," Domenicali confirmed. "We would have preferred to see a solution with much more energy being available (to KERS), but unfortunately an agreement could not be found." It is understood that the reason for staying with a lower power output is that some manufacturers would have had trouble adapting their existing technology. However, while it has been suggested that another major problem for KERS in 2009 is that the systems were voluntary to run, it has emerged that the units will not be compulsory in 2011. 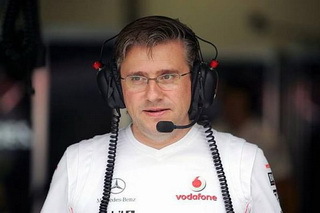 Mercedes, for instance, is considering whether to use KERS next year, even though a programme has already been initiated by the Brackley based squad with a view to a 2011 implementation. "We will make a decision (about KERS for 2011) within four to six weeks," said Ross Brawn. 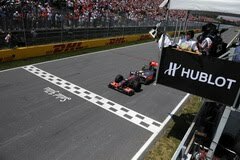 Lewis Hamilton and Jenson Button in their McLaren MP4-25s turned the world championship fight on its head in Montreal on Sunday afternoon, when they scored the team’s third one-two of the season after a tense race in which nobody was able to relax. It began with second fastest qualifier Mark Webber being moved back five grid places after Red Bull replaced his gearbox, then a collision between Ferrari’s Felipe Massa and Force India’s Vitantonio Liuzzi which split the field up and put some unfancied runners in places you wouldn’t have expected in the midfield. Up front Hamilton grabbed the lead from Red Bull’s Sebastian Vettel and Ferrari’s Fernando Alonso, with Button slipping into fourth as Liuzzi and Massa fell down the order to begin sterling recovery drives after pit stops. Soon it became apparent that those who had gambled on soft rubber in qualifying were in trouble: Button, Hamilton and Alonso all pitted for the harder Bridgestones within seven laps. 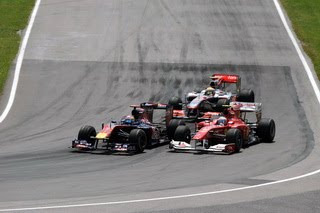 That left Vettel in the lead with Webber a surprised second, having closed in while Hamilton was struggling for grip. But when the Red Bulls pitted on the 13th and 14th laps the complexion of the race changed again. Vettel switched to the option tyre and lost ground; Webber stayed on the primes, intent on building enough of a lead to be able to stop for the options (as per the rules which say you have to run both compounds in a race) without losing first place. That plan was stymied by heavy mid-race traffic, and he eventually lost the lead before his final stop on Lap 50. That should have put Alonso in front after he’d outdragged Hamilton from their first pit stop, but the 2008 champion overtook the Ferrari on the final straight, and after that Alonso came under increasing pressure from Button, who took second place away on the 56th lap when the Spaniard was seemingly baulked by Karun Chandhok’s HRT. The Ferrari driver clung to third, comfortably ahead of Vettel, whose switch to a second set of the harder tyres didn’t improve his Red Bull’s speed. Webber had to run the final 20 laps on the options, which were good for a while before losing their edge. 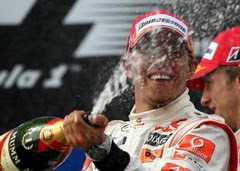 In the end that was how they finished, which leaves Hamilton in the lead of the world championship with 109 points to Button’s 106, Webber’s 103, Alonso’s 94 and Vettel’s 90. McLaren lead Red Bull and Ferrari, with 215 points to 193 and 161. Nico Rosberg lost time early on in the Liuzzi/Massa melee, but a few fastest laps in a strong comeback drive eventually earned him a solid sixth place for Mercedes, ahead of Robert Kubica who had an adventurous afternoon for Renault which included a brush with Michael Schumacher, harassment by Force India’s Adrian Sutil, a late pit stop for fresh tyres, and a trip to the stewards where he was asked to explain having to cut across Sutil when he made his second pit stop on Lap 35. The Polish driver was eventually handed a reprimand. Behind them, Sebastien Buemi drove a blinder for Toro Rosso, making the most of the first-corner incident. He was about to lead the race when he pitted for fresh rubber at the end of the 15th lap, and thereafter pushed hard all the way to eighth for the Faenza team. Michael Schumacher seemed likely to finish ninth, having savagely blocked Massa’s attempts to wrest away the place, but then he got caught by Liuzzi on the final lap, and then got shuffled out of the points when Sutil jumped him too going down to the last corner. The two Force India drivers were embroiled in a mighty scrap with each other, Massa, who set a series of fastest laps and lost his chance of points thanks to Schumacher, Nico Hulkenberg before the young German dropped back, and Jaime Alguersuari before the Spaniard, too, lost ground. In the end Liuzzi’s excellent drive paid off with ninth, but he could have been much higher without that first corner clash. 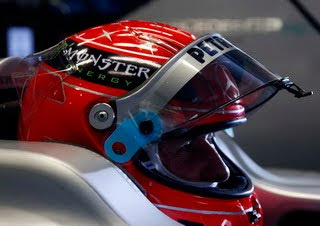 Schumacher was another who had to visit the stewards, but no action was eventually taken against him. Massa, meanwhile, was initially classified 15th, but then got another 20s added to his race time for speeding in the pit lane. 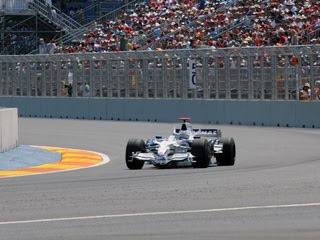 Alguersuari eventually took 12th from Williams’ Hulkenberg and Rubens Barrichello, whom the Spaniard had run into at the hairpin on the seventh lap. Heikki Kovalainen was a strong 16th, having at one stage run as high as sixth for Lotus after the early pit stops and having made up places hand over fist in the first corner. He led home Vitaly Petrov, who got two drive-through penalties for jumping the start, and then causing a collision with BMW Sauber's Pedro de la Rosa. Chandhok was 18th for HRT, ahead of the Virgins of Lucas di Grassi and Timo Glock which were the final finishers. BMW Sauber had an appalling race, with De la Rosa shoved into a spin even before he got to the first corner, Kamui Kobayashi biting the Turn 14 exit wall at the end of the opening lap, and then De la Rosa going out with engine failure. 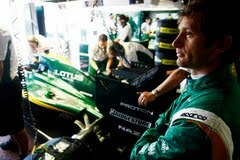 Jarno Trulli’s Lotus yet again fell prey to mechanical ills, as did Bruno Senna’s HRT. 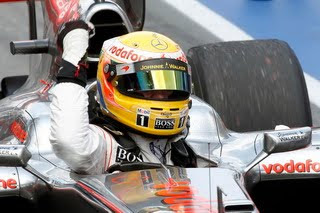 Lewis Hamilton took pole for the canadian grand prix as he edged Red Bull's Mark Webber. Every thing went as normal in Q1 with Lewis Hamilton topping the times and the new teams are fighting for the last six places,with Kamui Kobayashi the failing to make it to Q2,Heikki Kovalainen for Lotus was only eight tenth from 16th place Pedro De La Rosa. in Q2 the times were very close again at the top with Lewis Hamilton also fastest for the Mclaren team with less then a tenth between the top three cars, but the biggest surprise was Micheal Shumacher failing to make into Q3 and will start from 13th place wth both Williams ahead of him ,another surprise was Force India getting both cars into Q3. Lewis Hamilton was again the man to beat in Q3 setting 1:15.500 in the early minutes as only both Red Bulls and Fernando Alonso got bellow that time ,but Lewis Hamilton made a great lap right at the end of the session with 1:15.105 to take pole. Vitantonio Liuzzi made a great performance to start from six place behind Mclaren's Jenson Button And ahead of Ferrari's Felipe Massa. Things settled down a little in Montreal on Saturday morning as teams found better ways to generate grip in the continuing cold conditions on the Ile Notre Dame. And McLaren got back on top courtesy of Lewis Hamilton, but Red Bull were again close and things look good for an exciting qualifying session this afternoon. 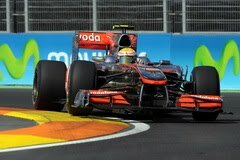 Hamilton lapped his McLaren MP4-25 in 1m 16.058s, leaving series leader Mark Webber back in second on 1m 16.340s. Then came Fernando Alonso for Ferrari on 1m 16.495s, Michael Schumacher for Mercedes on 1m 16.536s, Sebastian Vettel for Red Bull on 1m 16.582s, Robert Kubica for Renault on 1m 16.653s, Adrian Sutil for Force India on 1m 16.673s, Jenson Button for McLaren on 1m 16.699s, Tonio Liuzzi for Force India on 1m 16.814s and Vitaly Petrov for Renault on 1m 16.982s. There were plenty of incidents, with many drivers missing the chicane exits, but the most significant were Felipe Massa scraping a wall exiting Turn Five, and Lucas di Grassi hitting the outer wall as he spun his Virgin entering the hairpin. Massa ended the morning 12th on 1m 17.231s, behind Nico Hulkenberg’s Williams on 1m 17.121s and just ahead of Jaime Alguersuari’s Toro Rosso on 1m 17.331s. Then came the BMW Saubers of Kamui Kobayashi and Pedro de la Rosa on 1m 17.548s and 1m 17.609s respectively, and Sebastien Buemi’s Toro Rosso on 1m 17.633s. Rubens Barrichello lapped his Williams in 1m 17.789s for 17th, while Nico Rosberg was kept in the garage by mechanical problems on his Mercedes and literally had time for one flying lap right at the end – 1m 17.979s – which left him 18th. Jarno Trulli and Heikki Kovalainen were again the fastest of the new team runners with 1m 19.013s and 1m 19.447s respectively for Lotus, but Virgin had a much better handle on things today and got Timo Glock within striking distance on 1m 19.536s. Team mate di Grassi managed 1m 19.844s before his spin. Bruno Senna was 23rd on 1m 20.325s, but HRT team mate Karun Chandhok didn’t clock a time after stopping early in the session with technical problems. F1 is considering a radical innovation for 2011 in order to make overtaking much easier. 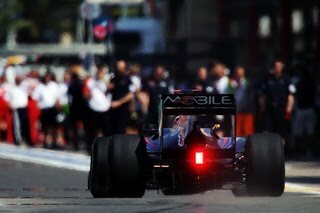 Technical bosses of the twelve teams met at the Circuit Gilles Villeneuve on Friday, where it was agreed that the adjustable front wings will be scrapped at the end of the season. Instead, drivers will next year be able to adjust the angle - by a factor of 50mm - of the rear wings, meaning that straight-line speed can be dramatically increased when the cars are not negotiating corners. The intriguing twist, designed exclusively to boost overtaking, is that only chasing drivers will be able to adjust their cars' wings. A green light will shine in the cockpit when a car is close enough to the rear of his rival, thereby allowing the driver to trigger the rear wing button. The systems will not be available to drivers during the first three laps of a race, but the wings may be triggered after a safety car period. "Why do we need KERS now?" Red Bull team boss Christian Horner joked to Germany's Auto Motor und Sport. "The overtaking wings will be enough!" Sebastian Vettel Leads the way in second practice for the Canadian Grand Prix ,Vettel's 1:16.877 which he set in the middle of the session was good to stay in the lead ,Ferrari's Fernando Alonso was second with less than a tenth down on Vettel's time,the session saw Mclaren running on high fuel loads in the end of the session they may be hidden their true pace for Qualifying. Mclaren's Jenson Button Leads the way in the first practice of the round eight of the FIA Formula1 world championship in Montereal with Mercedes's Micheal Shumacher splitting the two Mclarens in second place . The session started with the track dirty as no one did a flying lap in the first 30 minutes ,the session saw many mistakes from almost every driver as the drivers were trying to get to grip with track . Felipe Massa carried a lot of work In the F10 as he tried a new rear wing and was running in different pace to teammate Fernando Alonso.